Many Durham restaurants and breweries allow well-behaved, leashed dogs on their outdoor patios. This is in no way a comprehensive roundup but will give you a starter list of go-to dog-friendly places where you can get food with your pup in tow. Sam’s Bottle Shop– 1112 NC-54, Durham, NC 27707- Sam’s has an awesome selection of beer and wine. There is a rooftop bar to sit & enjoy a brew. Pets are welcome, obviously. Motorco (Parts and Labor)– 723 Rigsbee Ave, Durham, NC 27701- Parts and Labor serves food truck-like fare that you can eat in their garage bar or at the picnic tables on their patio. We love their small plates that are available at affordable prices. Ponysaurus– 219 Hood St, Durham, NC 27701- Named a “Next Level Brewery” by Food & Wine, you’d be hard pressed to find a beer you don’t like at Ponysaurus. Their outdoor area is dog and kiddo friendly so it’s a great spot to bring the family. They don’t serve full meals but they have a great selection of bar snacks and you can usually find a food truck or two parked outside. OR you can bring your own food and fire it up on the grill. Bull City Ciderworks– 305 S Roxboro St, Durham, NC 27701- Using apples from a family-owned orchard, Bull City Ciderworks crafts hard ciders in the heart of Downtown Durham. You don’t even have to wait for it to heat up to enjoy their outdoor space. They have an awesome fire pit to keep you warm & cozy. Because what’s better than hanging by the fire with some crisp cider? Namu Beer Hall– 5420 Durham-Chapel Hill Blvd, Durham, NC 27707- They have a gorgeous bamboo garden topped off with a water fountain and koi pond, tons of outdoor seating that is pet and kid friendly. Now for the food. We can’t rave enough about their Korean eats. We 100% recommend the the Bo fries and spicy pork mandoo. Dogs are also allow inside their beer hall. Eastcut Sandwich Shop– 3211 Old Chapel Hill Rd, Durham, NC 27707- Love their sandwiches and love their outdoor area. There’s a greenhouse patio in the back with tons of picnic table seating. Gonza Tacos Y Tequila– 604 Fernway Ave, Durham, NC 27701- The overall ambiance of Gonza is amazing. Tucked beside West Village Apartments, you get the feel of those historic Brightleaf buildings, plus the string lights and food. It’s all on point. Parker and Otis– 112 S Duke St, Durham, NC 27701- Life would be much duller without Parker & Otis. I always find something so very ‘Durham’ here and a greeting card that makes me laugh out loud. This is the perfect place for an afternoon pick-me-up. They have a beautiful, large, shaded outdoor seating area. Foster’s Market– 2694 Durham-Chapel Hill Blvd, Durham, NC 27707- Foster’s is a Durham staple that is known for their scratch-made soups, salads, sandwiches, and casseroles. They have plenty of picnic tables and outdoor seating making it the perfect spot to enjoy that piece of pie. Geer St. Garden– 644 Foster St, Durham, NC 27701- Geer St. has a great patio with a gazebo and fans so it’s nice and shaded. Go for the Sunday brunch- you won’t regret it. Saint and Co.– 810 9th St Suite 130, Durham, NC 27705- Near the end of 9th Street, you find this cafe/pizza place. Their patio is HUGE and perfect for the warmer months. Clouds Brewing– 905 W Main St #22, Durham, NC 27701- Is there a prettier place to dine than Brightleaf? Clouds Brewing is a restaurant and bar focused on craft beer. Featuring 100+ beers and the Triangle’s first pour your own beer wall, The Downpour. Get some locally brewed craft beer and soak up the sun on their patio at Brightleaf Square. Local 22– 2200 W Main St, Durham, NC 27705- We love the farmhouse vibes at Local 22 and the fact that they use fresh, local ingredients. They somehow manage to try brussel sprouts into a crowd favorite. You can find us sipping drinks from mason jars on their outdoor patio this summer with our pup in tow. Tyler’s Taproom– 324 Blackwell St, Durham, NC 27701- With one of the best views of the Lucky Strike tower, Tyler’s Taproom has an awesome patio for grabbing lunch or soaking up the warm weather with a beer. There’s plenty of picnic tables to one side and tables in front of the restaurant that are adjacent to the river that flows through American Tobacco Campus. *Note: It’s a good idea to check in with any location before taking your dog with you. If you find that a location on this list is no longer pet-friendly, please let me know! Do you have a favorite spot where dogs are welcome? Contact us! 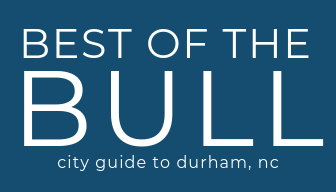 We’re here to make your life a little easier by bringing you the best things to do, places to eat, drink, and see in Durham.